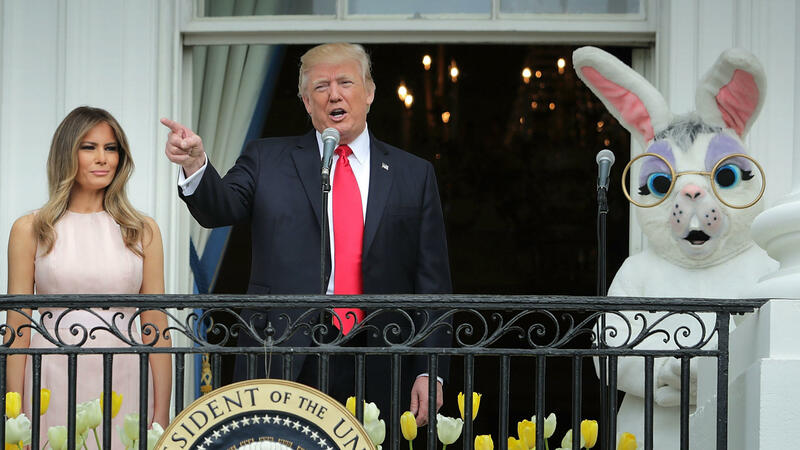 President Trump delivers remarks from the Truman Balcony with first lady Melania Trump and someone dressed as a bunny during last year's Easter Egg Roll on the South Lawn. 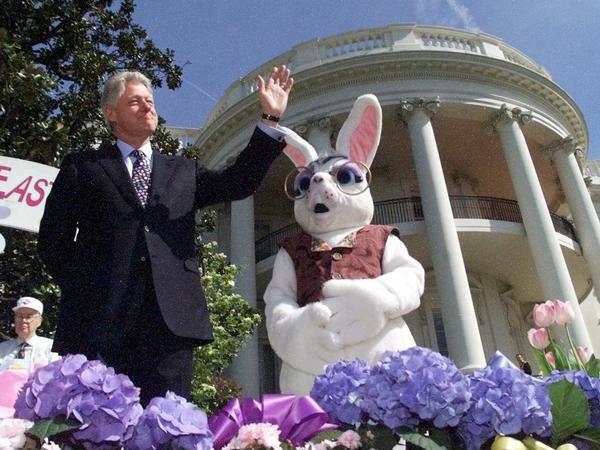 President Clinton, accompanied by the Easter Bunny, waves to White House visitors on the South Lawn during the White House Easter Egg Roll in 2000. President Obama, and the Easter Bunny, stand during the National Anthem at the 2014 White House Easter Egg Roll. President George W. Bush pauses to embrace a person dressed as the Easter Bunny during the Easter Egg Roll in 2008. 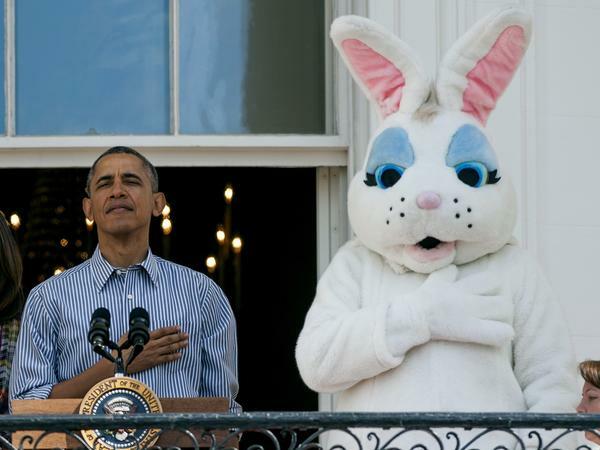 More than 30,000 people are expected for this year's White House Easter Egg Roll, and you can be pretty sure at least one of them will be wearing a terrifying bunny costume. The tradition of rolling eggs on the White House's South Lawn began 140 years ago, officially dating back to Rutherford B. Hayes's administration. Informal Easter festivities for children in the nation's capital go back even further. Schools in Washington D.C. used to close the day after Easter, so kids could "ramble at will on the fresh green grass of the Capitol," until Congress stepped in to ruin the fun with the ultimate "get off my lawn" move. The Turf Protection Act, passed in 1876, forbid using the Capitol grounds "as play-grounds." That bill led President Hayes to open the White House grounds for the first official Easter egg roll in 1878. 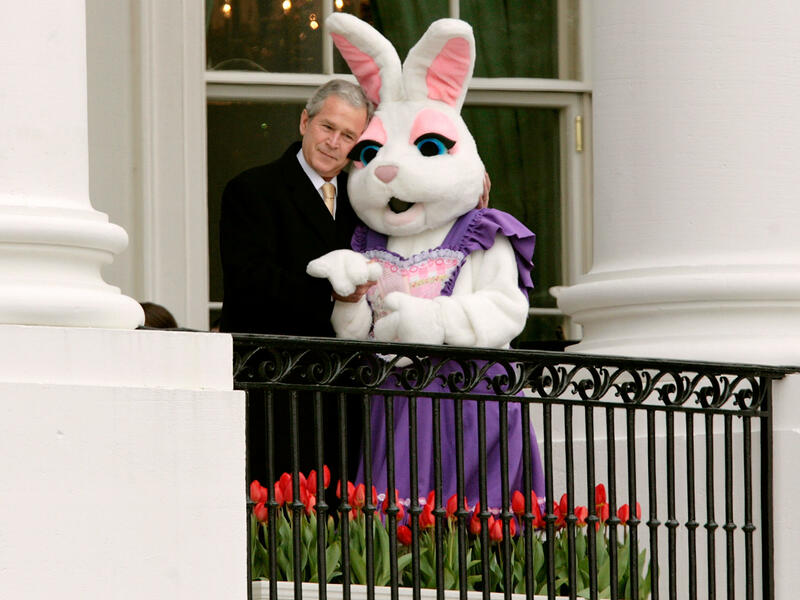 In recent years, the focus hasn't been on the president, or the first lady, who officially hosts the event, but on another guest: the Easter bunny. And more specifically, just how scary that costume is. "There will be hundreds of guests. Thousands of eggs," The Washington Post's Jose DelReal wrote in anticipation for 2015's egg roll. "And one very, very creepy-looking giant bunny." NPR has also documented the terror. 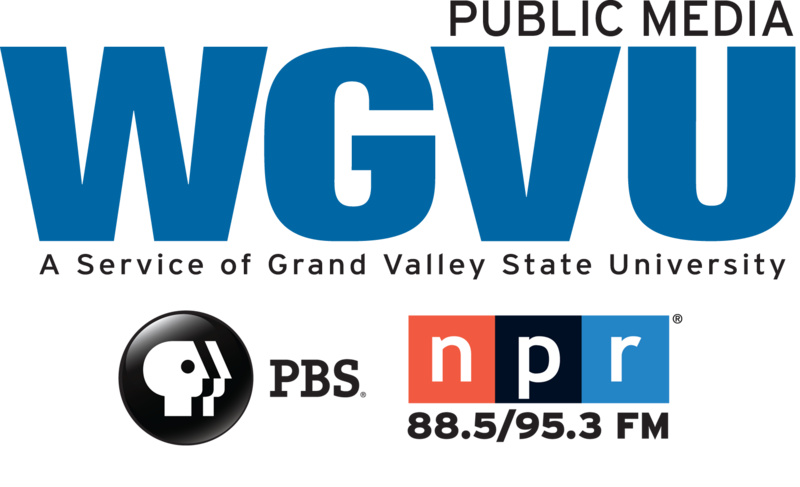 "I've witnessed such inconsolable fear myself," wrote NPR's Frank James in 2011. "I once attended one of these South Lawn rolls and saw the toddler child of a friend shriek at the sight of a bunny the size of a man. "Only leaving the White House grounds calmed the youngster." President George W. Bush, however, did not seem frightened. While spectators have been focused on the creepy costume for years, in 2017 the Trump administration ushered in a new era of intrigue: who is the person inside the lagomorph suit? Social media erupted last year with photos of then-press secretary Sean Spicer dressed as the bunny in the mid-2000s, leading Melissa McCarthy to reprise her Spicer impersonation, in a bunny suit. This year's egg roll will take place Monday morning. A White House announcement promises lawn bowling, egg decorating, and of course, "costumed characters."